Getting the winner banner is one thing. Getting a novel truly finished and published is the one goal I haven't crossed yet. Ditto hides disguised as low-value Pokemon, so that Rattata you've been ignoring could actually be a Ditto. 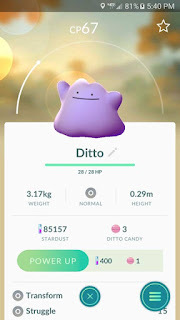 So you kinda have to catch everything you can now to add up the Dittos. AS GOD IS MY WITNESS I THOUGHT TURKEYS COULD FLY. Getting to the 50,000 word marker is relatively easy if you've gotten things plotted out, you've gotten the characters lined up, and you avoid the pitfalls of painting yourself into corners that you didn't expect. I'm hitting the 50,000 finish line a lot earlier than usual as well. Got a full week left of the NaNo campaign to get more of the bits and pieces I've got floating around here. See, writers have ideas. Ideas we want to express as either stories or essays. Once I start writing on something - a story or a blog article or other project - a plot idea or some form of insight suddenly pops up that I can incorporate into what I'm working on. Unless the idea doesn't fit. Then all of a sudden I have a plot idea or a topic worth discussing that I can't put aside lest I forget about it. So I find myself going off on tangents, dancing away from the novel/story project I'm on and typing away on an unrelated project. For example, I'm supposed to be working on my superhero origins novel for NaNo right now. However, I've suddenly got myself thinking about Pragmatism as an American philosophy and musing over the need to write up some amateur proto-philosophical chapters/articles before I lose track of THAT thought. This is one of the reasons why I've never really finished a full book. Hell, there's an idea on writing up a History of 20th Century Jamaica still sitting in a box in my closet. Get me back on track, fellow writers. Remind me I gotta finish this NaNo first and foremost. I can just tag the journal articles and books on James, Pierce and Dewey for later. Anyone got anything that can keep me going on my stories? The weekend is usually where you can find extra time to get some writing done on your NaNo draft. You can still fit in a few hours of writing in all that. Somewhere. NANOWRIMO ME BABY ONE MORE TIME! Start writing 50,000 words, people, it'll be a novel you can love and respect once you finish the editing process!